Ulele (pronounced You-lay-lee) opened in 2014 and has been a popular native-inspired restaurant for the locals ever since it’s opening in Tampa. Whenever friends come to visit, we like to take them here as it is a beautiful restaurant with gorgeous surroundings and delicious food. The restaurant is owned by Richard Gonzmart, who also owns the famous Columbian restaurants throughout Florida. Ulele is named after Princess Ulele, who was a Native American princess that lived in the 1500s and saved the life of a Spanish explorer. There is a beautiful statue of her in front of the restaurant and also on the lawn but that recently got taken down due to city regulations. The building was originally Tampa’s Water Works Building in 1906 where the spring next to it would pump water throughout the city. It also used to be a police training station so you will see some signs such as “Police Only Parking” throughout the building. While they were building the restaurant, they also discovered a tunnel leading to Ybor City and believe that t it was used during the Prohibition period. 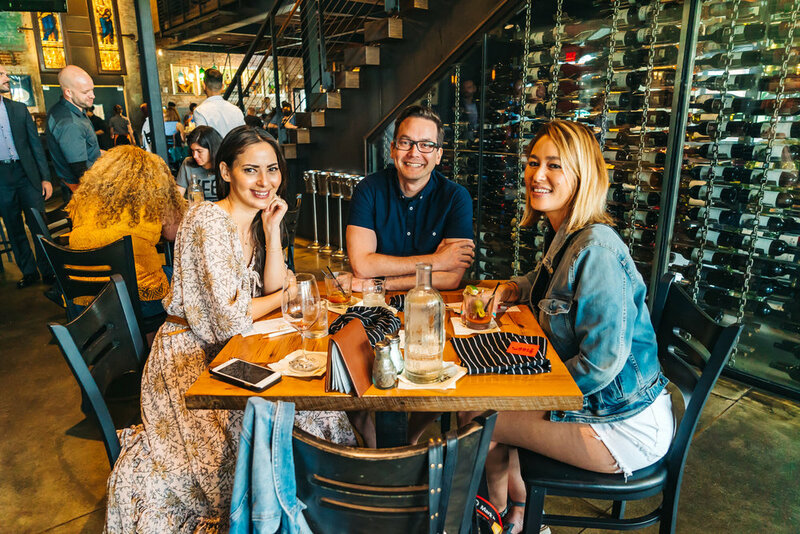 We’ve dined at Ulele’s plenty of times and we have always made reservations as it is a very popular restaurant in Tampa. If you don’t have reservations, there is also bar seating indoors and outdoors where you may be able to grab a seat. Or you can put your name on the long waiting list and see if a table becomes available. While you’re waiting, you can enjoy a leisurely walk around Riverwalk, enjoy some cocktails or pop by Armature Works next door. The interior of Ulele is very spacious with two floors. There’s a cool, industrial look with art pieces placed throughout the restaurant. All the art in the building is specially bought or commissioned for Ulele and also from Richard and Melanie Gonzmart’s private collection. There’s also a cool setup of their amazing display kitchen where you can watch the chefs prepare your meals on the large grills. The outdoor area is gorgeous as well with a bar, lounge chairs and games. This area is dog friendly as well, so you will see several customers with their dogs at the bar or around the lounge chairs. The bartenders keep an eye out for the furry friends and make sure to bring them out a bowl of water to help them stay hydrated. All the staff here are incredibly professional, courteous and friendly. They are all taught the history of the restaurant and the menu thoroughly and I’m always impressed with how much information they have to remember. They are also very accommodating to whatever you need. They do not want you to be unhappy at any means and will go above and beyond to make your experience at Ulele’s memorable. Ulele has some of the best food in the Tampa Bay area and many of their organic ingredients are sourced from family-owned or independent companies. The menu is native inspired, meaning a fusion of ingredients from Florida including fresh local seafood and beef from locally raised Florida cattle. They also have an on-site brewery called Ulele Spring Brewery and provide their own craft beers. They currently have the Rusty Red, Water Works Pale, Ulele Light, Magbee’s Honey Lager and Wedding Beer. We love to have a Bloody Mary, especially on a Sunday brunch, and Ulele makes a killer one crafted with their in-house Jalapeno Vodka. It’s slightly spicy and has all the goodness a Bloody Mary entails topped with a pickled okra garnish. We really wanted to try their shrimp as it's wild-caught, all-natural, and chemical-free. When this dish came out, we actually didn't know what it was since the shrimp was hiding underneath the panko. We usually see friend shrimp appetizers on menus, so it was nice to have a shrimp dish that wasn't fried. The shrimp was cooked just right and the panko gave it a nice texture. We’re always in a mood for mac & cheese and this is one of our favorite mac & cheese dishes to date. It’s very creamy and we love that they use seashell pasta as it absorbs all the yummy flavors. The panko sprinkled on top gave it a nice crunch that made this mac & cheese divine. You can also order this dish with crab for a few extra dollars. Ulele has a great selection of salads and the Three Sisters Garden is wonderful, especially if you’re in a mood for some squash and zucchini. The apple cider honey vinaigrette blended well with the squash and peppers. We are huge fans of salads that add ingredients that are charbroiled and all the ingredients were charbroiled just right. It made us want to try and make this dish on our own grills. If you are a seafood lover, Ulele serves a variety fo fresh fish and seafood. The pompano is seasoned beautifully and the fried carrot ribbons was light and crispy that paired so well with the fish. The green beans have a nice light crunch to them with a hint of garlic flavors. Some other dishes you should try are the Okra Fries, Alligator Hush Puppies, Water Works Meatloaf and Charbroiled Oysters. All these portions are so huge that by the time we’re done with our meals, we have no room for dessert. If you have room for dessert, the restaurant highly recommends the Candied Bacon Maple Ice Cream made with their homemade ice cream. Thankfully, there’s plenty of parking around Ulele. You can street park around the area or park in the huge parking lot behind the restaurant. On weekends, there may be an attendant at the parking lot that will have you pay $5 but they give you the $5 back when you show them a receipt from Ulele’s. They also offer valet parking.